The notebook with Beema. 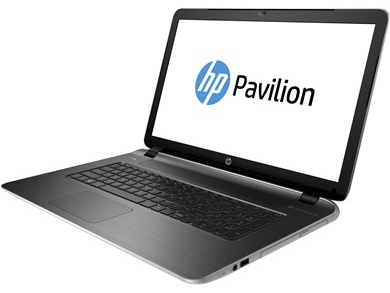 The HP Pavilion 17-f050ng comes with the latest Beema generation of AMD APUs. Read our review to find out why the review sample really surprised us. For the original German review, see here. 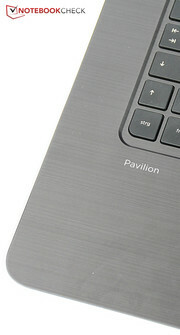 The reviewed model is the Pavilion 17-f050ng, while the equivalent U.S. model is the Pavilion 17z. Some people at AMD probably have fond memories of the '90s, when AMD CPUs blew Intel's Pentium away: By now, the big rival pretty much pulled away. However, the company made a name for itself amongst gamers with their graphics cards, and they also produce the CPUs for almost every known gaming console. 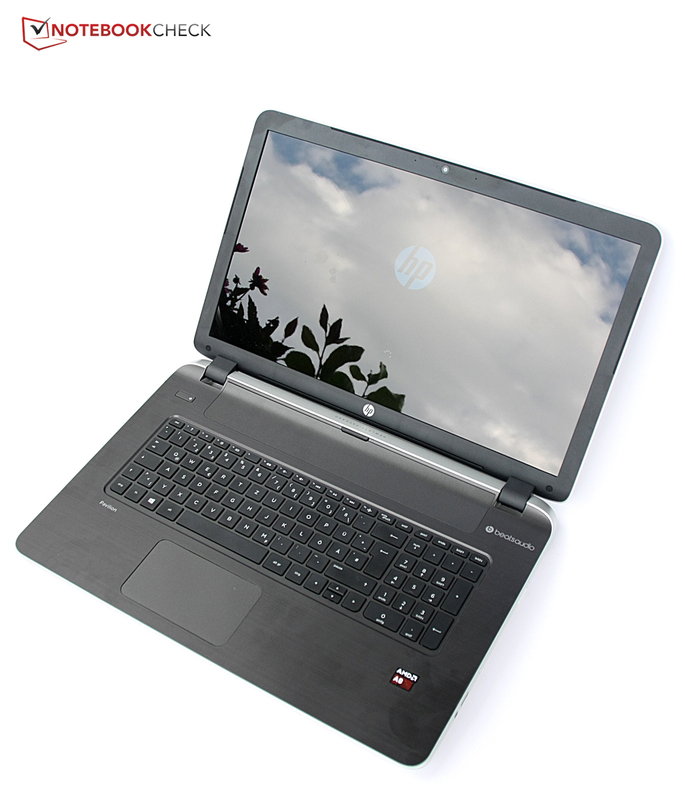 But there are still notebooks with "AMD inside," for example, the HP Pavilion 17-f050ng, which uses an AMD A8-6410 APU that combines a processor with an integrated graphics unit. The processor is from AMD's second-highest series of mobile processors (A8); it has four cores and the integrated Radeon R5 GPU. We are interested to see the performance of the graphics card in particular since we did not review it yet. At just 389 Euros (~$512), the Pavilion 17-f050ng is very cheap for a 17-inch device, and the number of laptops in this price range is not very big. Still, there are some similarly priced rivals like the Packard Bell EasyNote LE69KB in two versions (with AMD E2-3800 or AMD A4-5000) and the Lenovo G700 that we reviewed last year. Slightly more expensive are the Acer Aspire E1-771 and Toshiba Satellite C70D-A-10L. 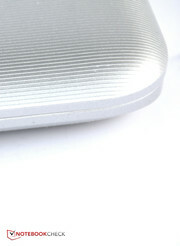 The top of the base unit has a nice aluminum look, but it attracts fingerprints. For less than 400 Euros (~$526), the Pavilion 17-f050ng has a case that leaves a pretty sophisticated impression. You obviously don't get any metal in the case for this price, but the used plastic still feels very good. 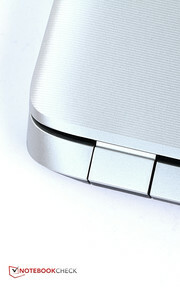 The silver-gray display cover has grooves from the left to the right; silver-gray is also the color at the sides that have a bold swing toward the back at the hinges. 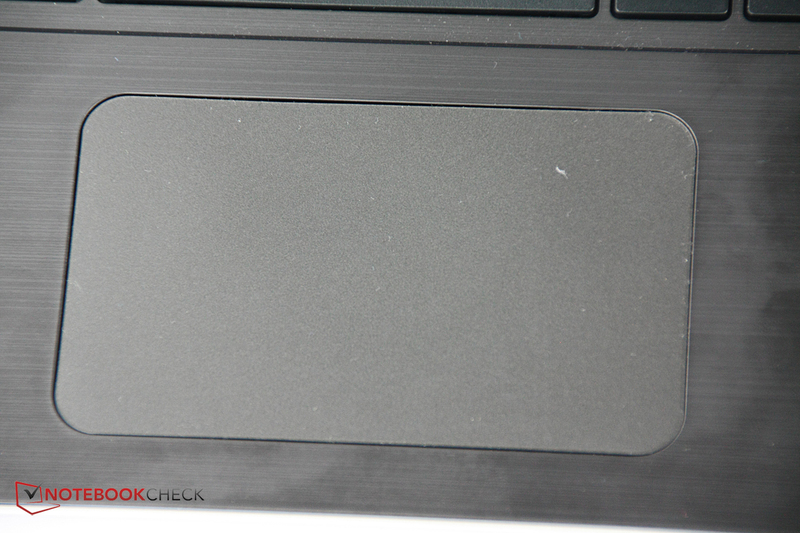 Open the notebook and you can see darker colors, the area around the keyboard is anthracite and looks like brushed aluminum; the display frame has a slightly roughened and matte surface. The swing toward the top is also directed at the hinges on the inside, which is a nice design trick. Between the hinges is a grille that covers the speakers. The chiclet keyboard almost looks a little lost in the large chassis, which is 2.5 centimeters deeper than the Lenovo G700. With a height of 27.7 millimeters and a width of 419 millimeters, it also surpasses many competitors, but it is significantly lighter in return: weighing only 2.64 kilograms. The case also leaves a noble impression despite its dimensions. The stability meets the price range and is not perfect by any means, but not really bad, either: The display can be twisted quite a bit, which also results in picture distortions on the screen. However, the base unit is pretty sturdy, hardly makes any noises under pressure and keyboard flexing is only an issue with a lot of force. The connectivity of most competitors is pretty similar in this price range: Three USB ports, one of them usually a USB 3.0 port, VGA, HDMI and two stereo jacks. Sometimes there is also a Gigabit-Ethernet controller for fast wired network connections. Can the Pavilion 17-f050ng stand out from the competition? At a first look you can quickly see a negative aspect, the missing VGA port, even though all the rivals have one. However, the importance in practice is pretty small for private users anyway. The combined stereo jack might be a bigger issue if you want to attach a high-quality gaming headset with one connector for the microphone and the headphones each. 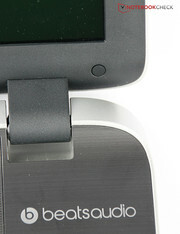 However, smartphone headsets with a combined connector can easily be attached. Gigabit-Ethernet is missing as well. 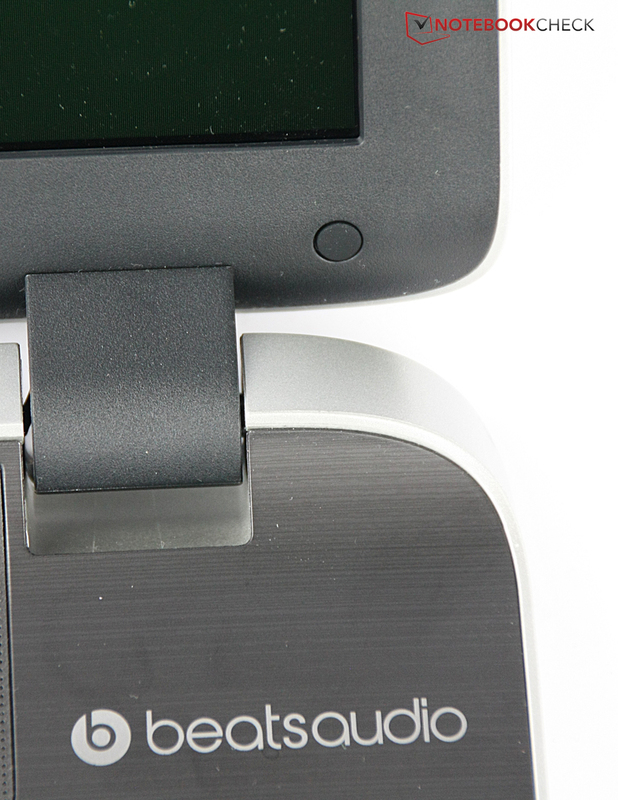 This means that some devices in our comparison offer a better port variety. Still, the Pavilion 17-f050ng has all the essentials for private users. 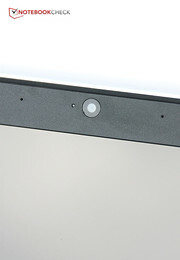 The webcam above the display convinces with dual-array microphones and 720p resolution at a first look. However, the pictures are pretty blurry and don't show many details, but it should be sufficient for occasional video calls. The wireless communication between the router and the Pavilion 17-f050ng is handled by a WLAN module from RealTek that supports all the common standards up to 802.11 n and therefore establishes network connections with up to 300 Mbps. The signal quality is good, even with a distance of ten meters from the router and through three walls: Windows indicates full reception or 4/5 bars. Another two meters and another wall between the device and the router results in a drop to around 50%, but webpages are still loaded quickly. HP's web shop does not offer any special accessories: Standard bags, wireless mice – but there are no dedicated accessories just for the Pavilion 17-f050ng. HP charges about 80 Euros (~$105) if you need a new power adaptor. Unfortunately, the case does not leave a good impression in terms of maintainability: You can easily replace the battery, but you cannot access any other component. There are numerous Philips screws at the bottom of the device, but we could neither lift the bottom cover nor the top of the base unit after we removed them. This means users cannot access the memory, the hard drive or the cooling unit to replace or clean them without a manual. 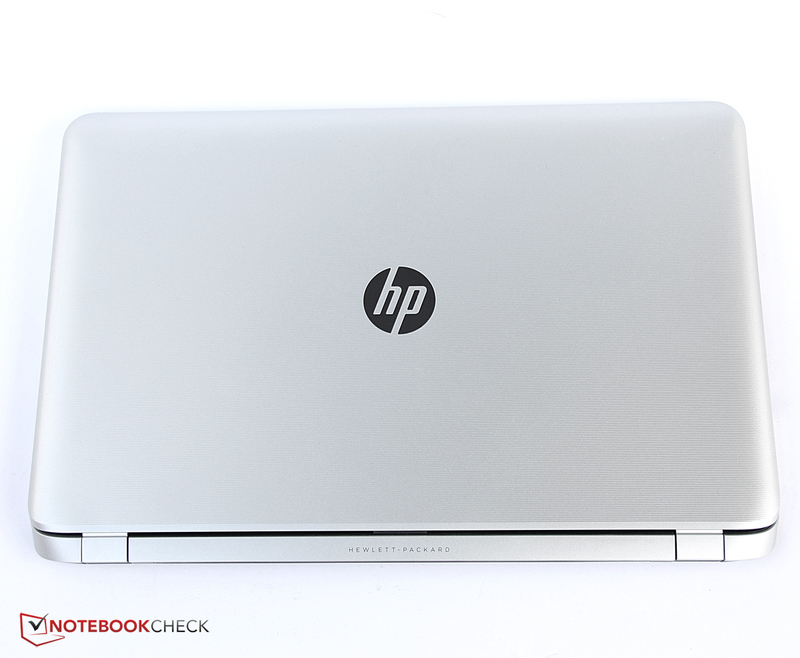 The warranty period of the notebook is one year, where HP picks up your notebook, repairs it and returns it to you. This warranty can be extended with several services in the shop. Another year costs around 65 Euros (~$85), a total of three years is available for 101 Euros (~$133). An additional accidental protection is offered for 101 Euros (~$133) for two years and 173 Euros (~$227) for three years, respectively. The chiclet keyboard sits in a slight depression inside the chassis and has a nice design: It has the shape of a rectangle with rounded corners. The input almost looks a bit lost in the large case of the Pavilion 17-f050ng, so we cannot understand why the arrow keys are not separated, why they are sometimes only half-sized and why the top row only has 10-mm high keys? The layout is logical, however, and the clear key lettering is convenient without frills. The special functions on the keys F1 to F12 are activated by default, you can, for instance, control the volume or the display brightness. Flexing is, fortunately, not a big issue and the standard keys are conveniently sized with 17 millimeters. A spacing of 3 millimeters should be sufficient to reduce typos. The typing noise is not very sophisticated: The keyboard creates a hollow noise. The stroke is not really absorbed and sometimes pretty hard, but the keys are smooth in return and you can quickly type thanks to the low travel. However, this also affects the feedback during typing, which is rather imprecise as a result. We are actually pretty happy with the keyboard for this price. You don't get an extremely comfortable typing machine with a lot of feedback, but at least a sturdy keyboard with clear lettering. Even longer texts should not be a problem thanks to the large keys and the small travel. 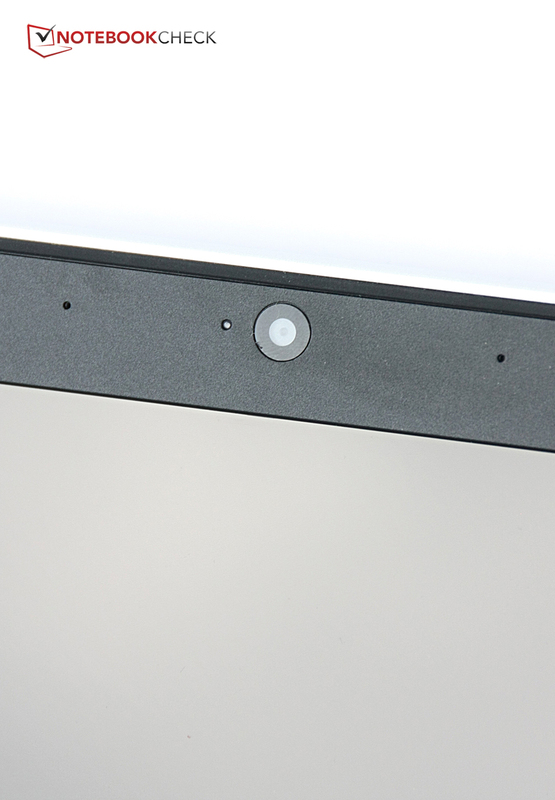 We are positively surprised by the touchpad as well. At first we were skeptical about the ClickPad, which means the buttons are directly integrated into the touch-sensitive surface. 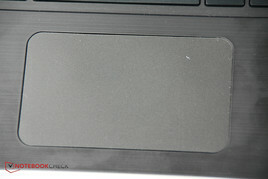 But this ClickPad is surprisingly precise: Even Drag & Drop always worked well during our review. 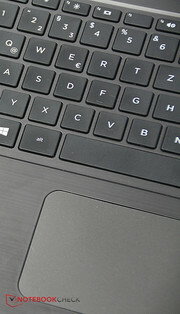 The touchpad surface is also very large with a diameter of 121 millimeters. The surface itself is convincing with good gliding capabilities and even multi-touch gestures like zooming or scrolling with multiple fingers are recognized correctly most of the time. It is somewhat unfortunate that clicks don't feel very sophisticated: The buttons have a large travel and the resulting noise is pretty loud. However, for this price range, the touchpad is almost impressive. The TN LED display of the HP Pavilion 17-f050ng has a resolution of 1600x900 pixels, which is pretty much standard for a 17.3-inch notebook in this price range. This results in a pixel density of little more than 106 ppi, which is slightly above a 15.6-inch screen with 1366x768 pixels. The Full HD resolution would obviously be better, but none of the comparison devices has it. 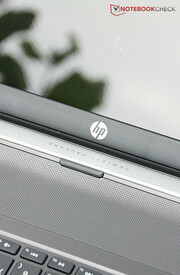 Overall, the picture on the screen of the HP Pavilion 17-f050ng appears very sharp and clear. If you get closer to the screen of our review unit you can see a slight grid in the picture that is actually annoying and exhausting for the eyes. None of the comparison devices can convince with a very high display brightness; the Pavilion 17-f050ng is actually worse than the other devices: 214 cd/m² on average is the second-worst result in our comparison. At least the brightness distribution is somewhat even with 88%, which means you cannot see brightness differences even on large colored surfaces. The HP Pavilion 17-f050ng once again only manages the second-worst result in regard to the contrast ratio: 350:1 is not a very good result. Colors looked a bit pale in the colorful Windows 8.1 start menu, even though the glossy display surface should provide rich colors. The pretty high black value of 0.68 cd/m² leads to gray instead of black areas. 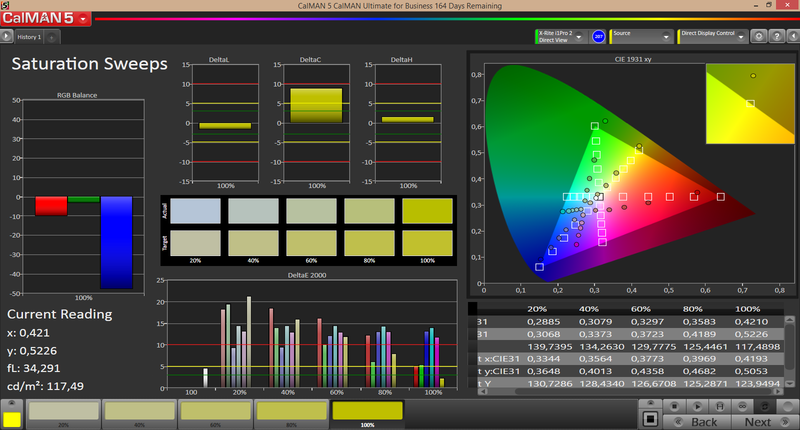 We use CalMAN software and special measurement devices for a further color analysis. Our measurements quickly reveal an extreme blue cast, which is visible with pastel colors in particular. Full colors like rich red, yellow or green are not as affected. The grayscale also extremely suffers from the color cast. 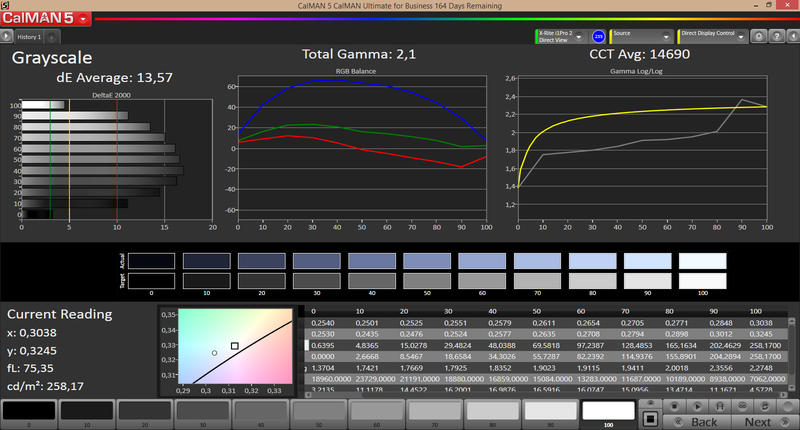 The high color distortion from the ideal value of the reference color space sRGB can be explained with the blue cast as well. Blue colors are, unfortunately, not perfect either, but the saturation is too low. All in all this results in a cool and lifeless image. You can create a warmer image with the corresponding Windows settings, but even then the picture is not suited for professional scenarios because you cannot trust the colors, which can result in varying results when you print something. These are only small issues for private users, but not everybody is going to like the cool picture. The glossy screen and the mediocre brightness make it hard to use the notebook outdoors or in front of a bright background because of the strong reflections. The mediocre luminance cannot compensate for these reflections, so you can hardly see the display content in most situations. 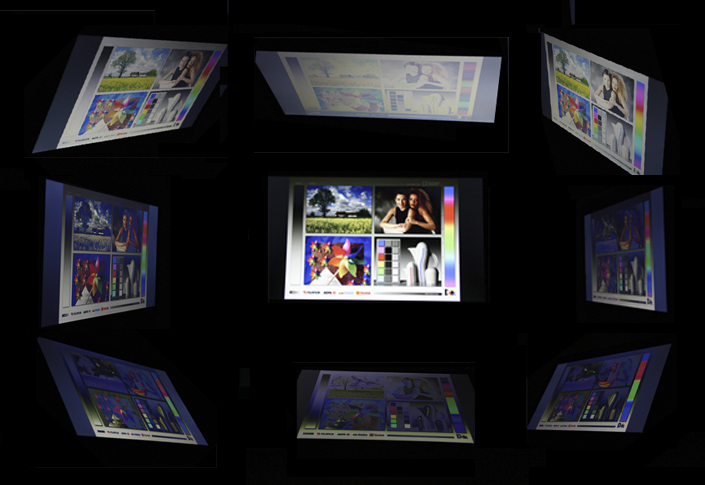 It is also exhausting for the eyes to look at the display content with these reflections for a longer period. The Pavilion 17-f050ng is not really designed for use on the road because of its size, but it is still unfortunate that even bright windows can be a problem for the screen. The viewing angles from the sides are decent, but the contrast is slightly reduced with horizontal viewing angles above 30 degrees. However, vertical shifts quickly result in picture distortions (colors and contrast). 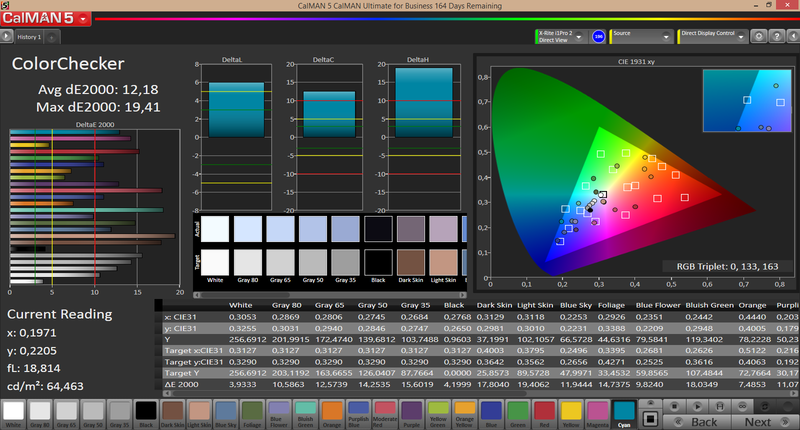 This makes the correct color presentation even harder since the colors can change depending on the viewing angle. A vertical shift of around 20 degrees results in clearly visible picture distortions. The performance of notebooks in this price range is usually sufficient for office tasks, movie playback and web browsing. If you want to perform more demanding tasks with your laptop like picture editing or semi-professional video editing, you should get a more powerful device. The HP Pavilion 17-f050ng has a pretty high processor clock of 2 GHz, and the AMD A8-6410 has four processor cores. 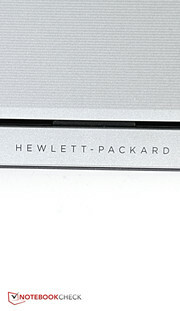 The CPU is supported by the AMD Radeon R5 (Beema) GPU, 4 GB RAM and a conventional hard drive with a capacity of 500 GB. The processor is provided by AMD, is called AMD A8-6410 and it runs with a core clock of 2 GHz that can be raised up to 2.4 GHz. 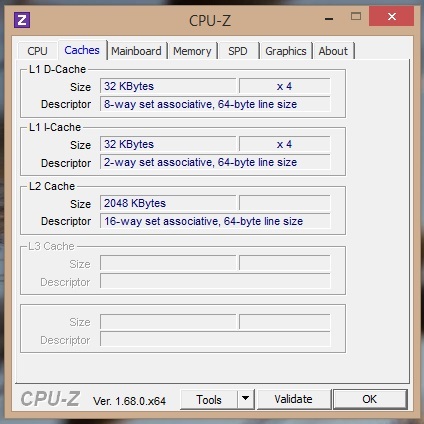 Each of the four cores can only execute one task at a time, which means they don't support Hyper-Threading. The performance should be sufficient for light multitasking as well as simple applications; the operating system and applications were pretty fast in practice. However, you will have to live with small delays; for example, when you switch to the Windows 8.1 start menu. 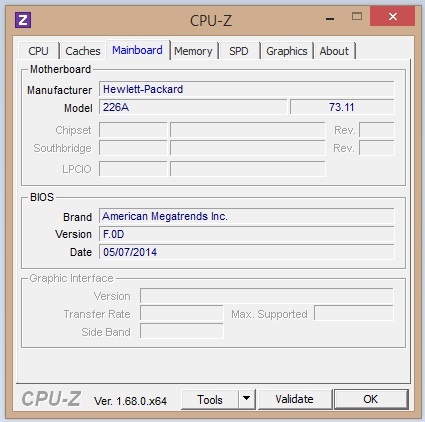 The HP Pavilion 17-f050ng is therefore clearly faster than the two configurations of the Packard Bell EasyNote LE69KB with AMD processors from the last generation: The difference is between 30% and 45% in the synthetic benchmarks. The Lenovo G700 with a higher clocked Pentium 2020M is faster in single-core applications in particular and the Aspire E1-771 with a standard voltage Core i3-3110M is also around 10% faster in multi-core scenarios. 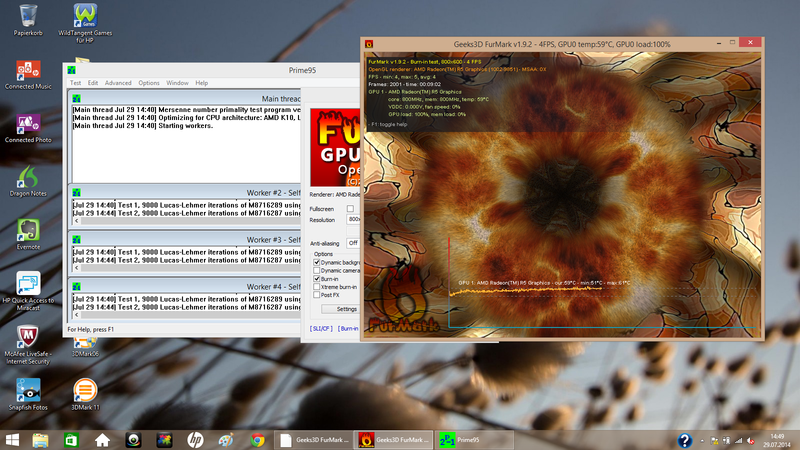 The AMD A8-6410 basically does a good job and performs pretty well, especially when you utilize multiple cores. The performance advantage over the last generation is clearly visible, and the CPU can keep up with current (Low Voltage) Intel processors in this price range. Good: The maximum clocks of 2.0 and 2.4 GHz, respectively, can also be used on battery power. The system uses the standard components for this price range: 4 GB memory in a single-channel configuration, a processor with an integrated graphics card and a conventional hard drive with 500 GB and pretty slow 5,400 revolutions per minute. 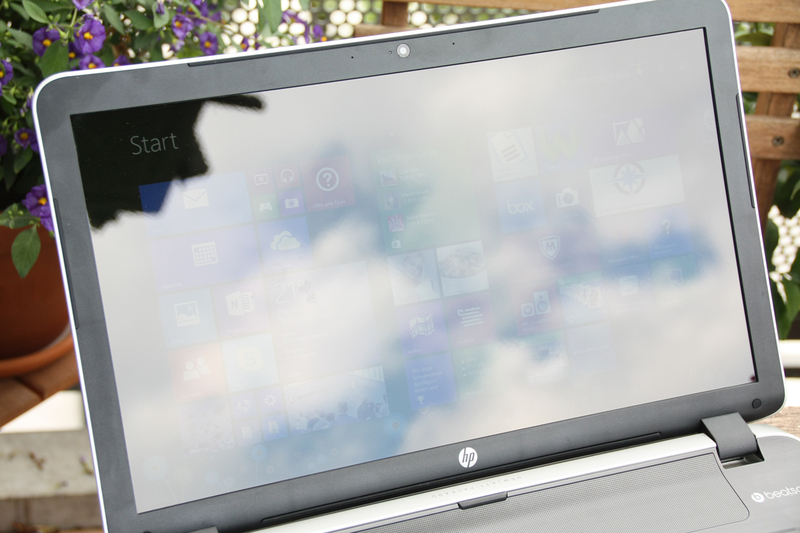 This means the HP Pavilion 17-f050ng hardly differs from its rivals. 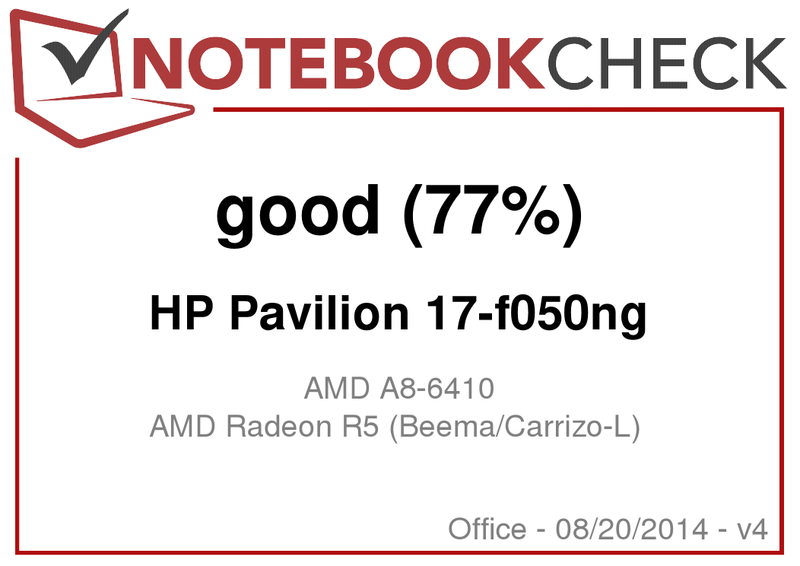 If you compare the PCMark 7 results with other notebooks in this class, you can see that the Pavilion 17-f050ng is average. 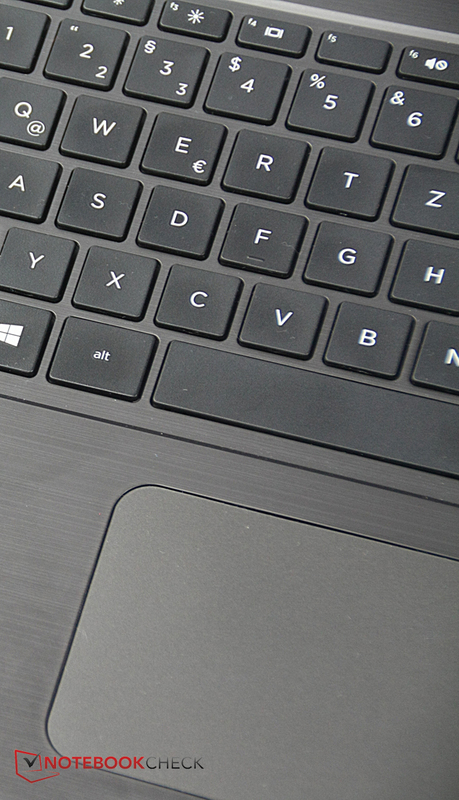 Our review unit beats the Packard Bell EasyNote LE69KB with an AMD processor from the last generation; the main differences are the processor and the slightly faster graphics solution. The Toshiba MQ01ABF050 is a conventional hard drive with a capacity of 500 GB and 5,400 revolutions per minute. 464 GB is available for the user because there is a recovery partition. The hard drive is neither particularly fast nor slow in regard to the transfer rates, but it is obviously much slower than an SSD. Because of the limited maintainability of the HP Pavilion 17-f050ng you cannot use such an SSD. This is unfortunate, boot times and application launches in particular could be accelerated. The AMD Radeon R5 (Beema) is integrated into the APU, which means it cannot use dedicated memory and has to share the memory with the CPU. The two compute units are clocked at 800 MHz and support DirectX 11.2. The Radeon R5 (Beema) is significantly faster in the synthetic benchmarks compared to the Radeon chips that AMD used for the old processor generation. Depending on the benchmark we can see an advantage between 9% and 37%. Overall, the Radeon R5 (Beema) is probably not suited for current 3D games because the performance is just too low. We will have a closer look in the section Gaming Performance. We already know that integrated graphic solutions are not perfect for gaming. Intel's current HD Graphics solutions at least manage smooth gameplay of some titles with low details and heavily reduced resolutions. Can the same be said about the AMD Radeon R5 (Beema)? The pretty clear answer is no, except for some very old or very simple games. Anno 2070 is a small highlight with an average frame rate of 32.3 with a low resolution and low details, but there can still be dropped frames when you scroll through a densely populated island. No current 3D game can be played smoothly with the AMD Radeon R5 (Beema), not even with the lowest settings. Some titles like Borderlands 2 can be played, but very complex scenes quickly result in dropped frames. Other games like Thief don't run at all even on the lowest settings. This means the GPU can only handle casual or browser games. Any game that requires at least some GPU performance should be played on a notebook with a dedicated graphics card. You don't have to expect very loud noises from the HP Pavilion 17-f050ng in practice: The maximum system noise during our review was 34 dB(A). This is very quiet, even under maximum load. The fan is never completely deactivated, but it is almost inaudible during idle with up to 30.7 dB(A). You can, however, clearly hear the hard drive in this case. The drive is not as restrained as we hoped. Our comparison devices are on a similar level but can be even quieter under load (Packard Bell EasyNote LE69KB: 31.3/31.7 dB(A) or Lenovo G700: 32.1 dB(A)). The temperatures do not cause any criticism, either: The maximum surface temperature that we were able to measure during our review was 36 °C at the front left bottom. The maximum temperature at the top was 33 °C. This means even the warming under maximum load is just slightly perceptible and the notebook never reaches critical values. However, it is a curious decision by HP to locate the components and the cooling solution so that the palm rest is the warmest part since this is a frequently touched area. The power adaptor also gets slightly warm but always stays lukewarm and you don't have to be afraid to touch it. The temperatures of the HP Pavilion 17-f050ng are very similar to our comparison devices, but we can actually see another behavior: The Acer Aspire E1-771 or the Toshiba Satellite C70D, for instance, don't get as warm but have some hot spots in return, whereas the two configurations of the Packard Bell EasyNote LE69KB get warmer, but the temperature distribution is more even. One outlier is the Lenovo G700, which gets pretty warm under load with 44.5 °C. The warming is at least focused to the left rear. We simulate maximum load for the CPU and the GPU with benchmarks in our stress test and observe the temperatures and the performance of the components. This test is not really important in practice, but it is a good indicator if there will ever be temperature problems or a reduced performance. This is not the case for the Pavilion 17-f050ng: The graphics card does not get warmer than 61 °C, even under maximum load. A 3DMark06 test run immediately after the one-hour stress test shows the same score as before the stress test, so the performance does not seem to be affected. The same applies for the CPU score. 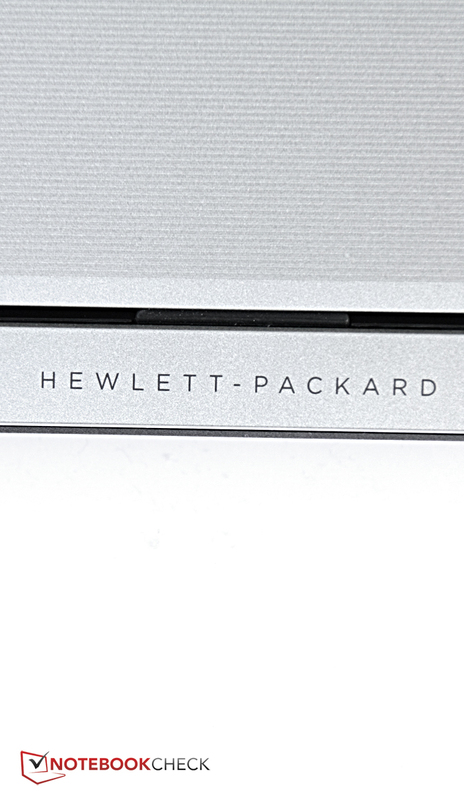 "The best sound you ever heard from a PC" – quite a big promise on HP's website. 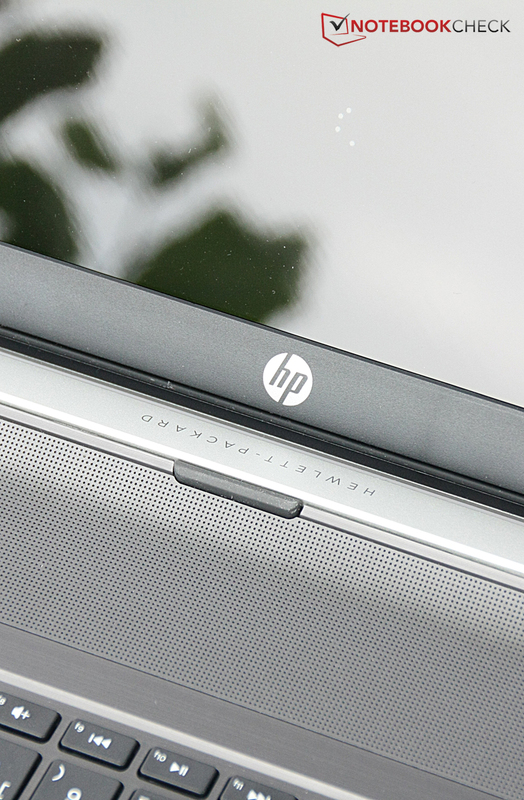 Let's see how good the speakers inside the HP Pavilion 17-f050ng really are. 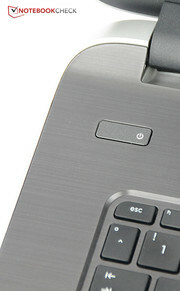 They are located above the keyboard behind a perforated grille and direct the sound toward the user. The Beats Audio logo on the right side reveals the support of the popular headphones manufacturer. However, this support is limited to software that improves the sound. We really like the sound quite a lot: Pretty high maximum volume, good balance between medium and high tones as well as a pretty rich sound. The Beats Audio software can actually improve the result: The music sounds much richer and dialogues in movies are clearer. 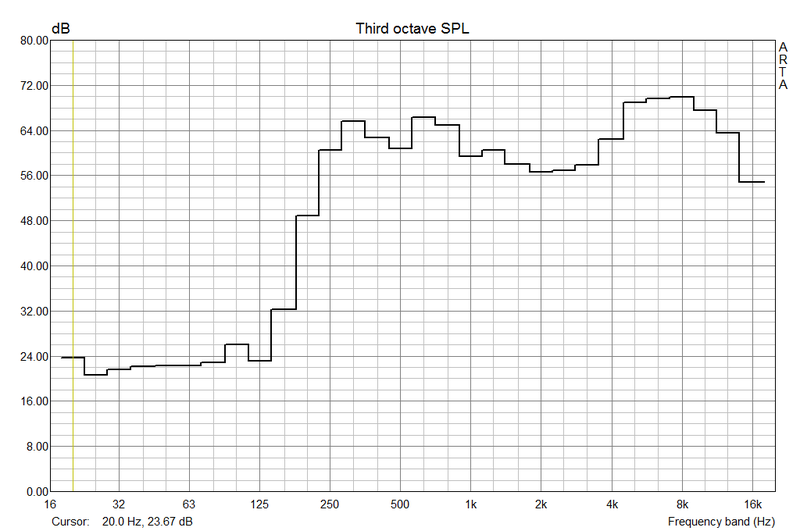 However, bass is rather indicated, and we can sometimes hear slight distortions at the maximum volume. 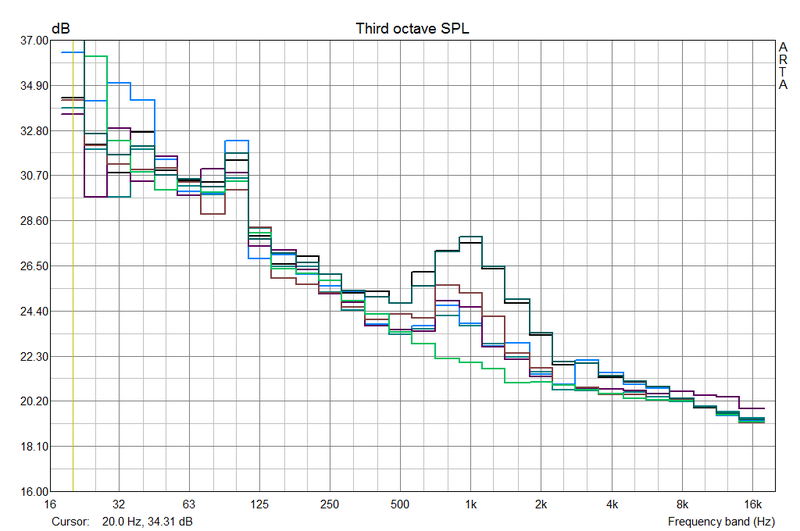 The maximum volume is pretty loud with almost 70 dB(A) in the Pink Noise test. Here we can once again see the weak bass. Our verdict: The sound is actually really good for such an inexpensive notebook, and the sound of the Packard Bell EasyNote LE69KB or the Acer Aspire E1-771 is pretty much outclassed. The marketing statement from HP is still exaggerated; you should at least attach a subwoofer to enjoy music. The speakers cannot keep up with really good notebook sound systems in much more expensive multimedia notebooks like the Asus N750JK, either. The TDP, more precisely the maximum power consumption of the low voltage models from the AMD A8-series, could be reduced compared to the predecessors and is now specified with 15 Watts, which is similar to the low-voltage processors from Intel. 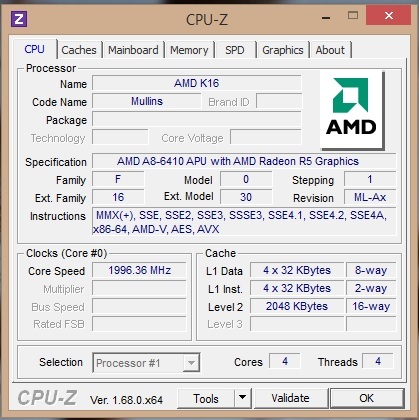 The AMD A8-5545M, for instance, still consumed up to 19 Watts. This means the overall power consumption should have improved, and the APU should be able to keep up with Intel processors. The HP Pavilion 17-f050ng actually consumes much less power than the other comparison devices with AMD processors from the previous Kabini generation, which also had a TDP of 15 Watts – at least with light workloads. The maximum consumption of 28.7 Watts is higher due to the more powerful graphics solution. The two Intel processors in the comparison (Intel Pentium 2020M in the Lenovo G700 and Intel Core i3-3110M in the Acer Aspire E1-771) have a TDP of 35 Watts and therefore consume slightly more power in all scenarios but also provide more performance in return. 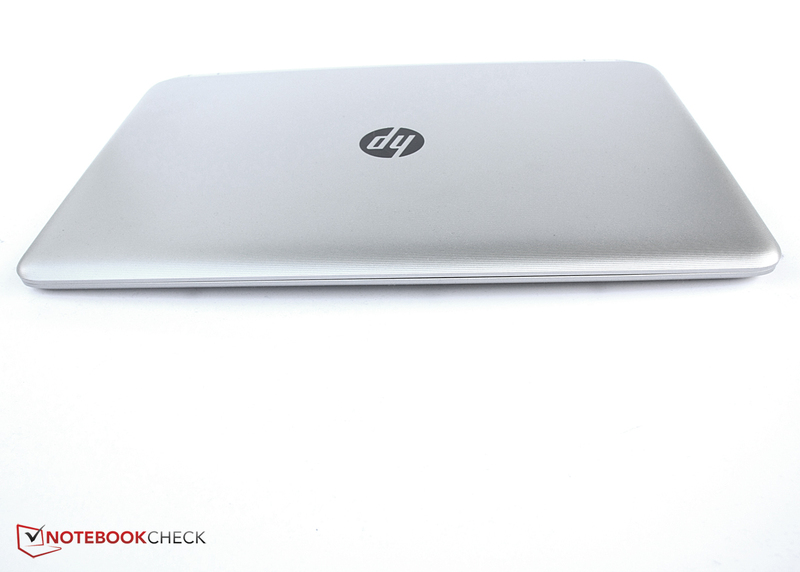 The 4-cell battery of the HP Pavilion 17-f050ng has a capacity of 41 Wh and is smaller than the batteries of the comparison devices. 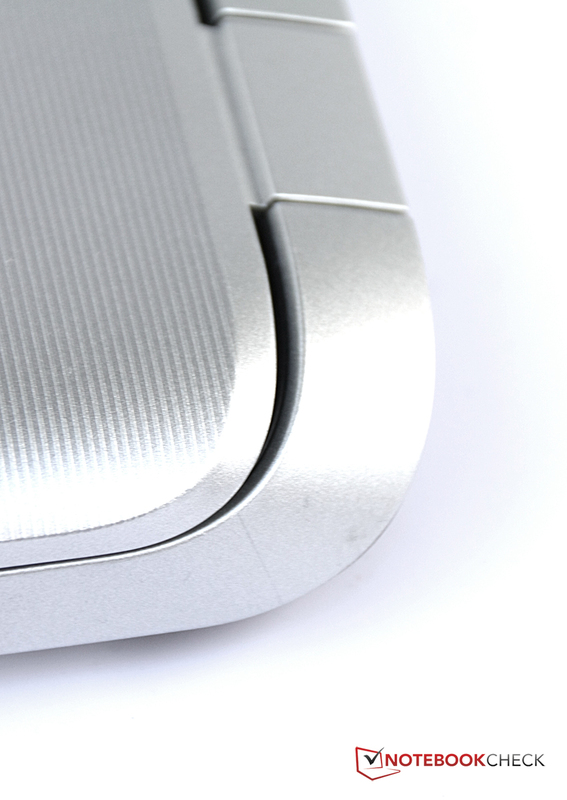 Almost every rival has a 48 Wh battery, only the Acer Aspire E1-771 is limited to 44 Wh. The Pavilion 17-f050ng saves energy but has the smallest battery within our comparison – it will be interesting to see the effects on the runtime. You can browse the web via WLAN for 4:34 hours before the notebook has to be recharged again. This is basically not a bad result for a 17-inch notebook, even though the runtime could have been much longer with a bigger battery. 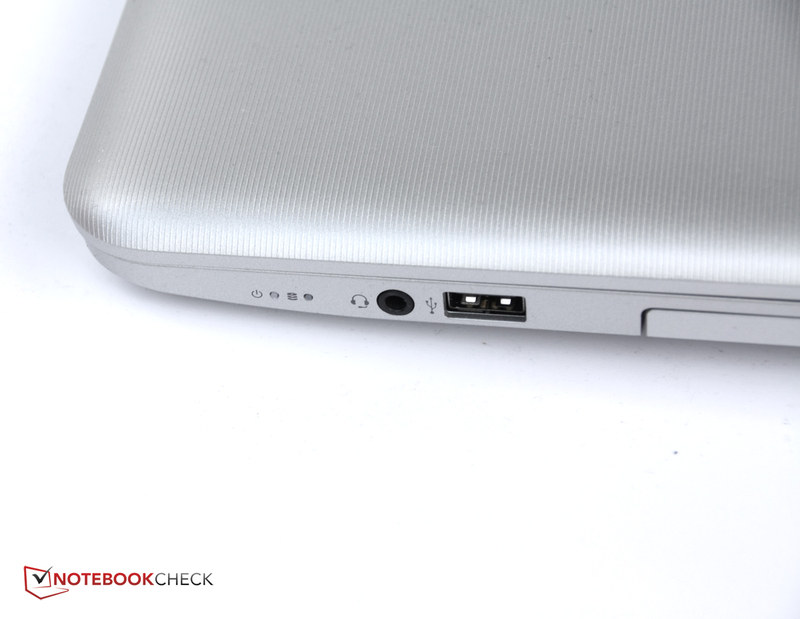 The two configurations of the Packard Bell EasyNote LE69KB and Lenovo G700 manage more than 5 hours. 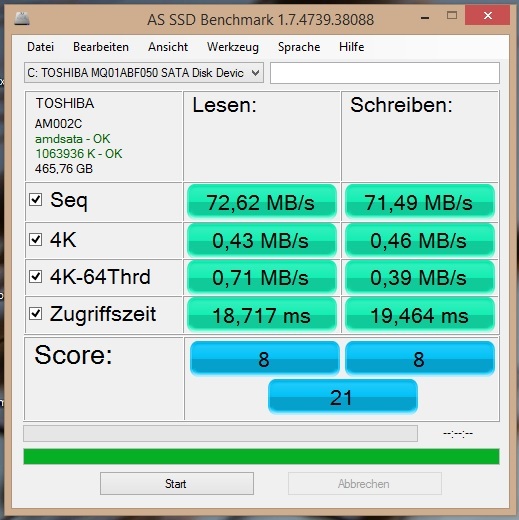 The Acer Aspire E1-771 and Toshiba Satellite C70D only run for 3 and 4 hours, respectively. The runtime of the Acer can be explained with the standard voltage CPU and the small battery, but there is no obvious explanation for the short runtime of the Satellite C70D. DVD playback with the Pavilion 17-f050ng is possible for 3:34 hours, which should be enough for one movie with extra length or two regular movies. We are surprised that a notebook for less than 400 Euros (~$526) can really impress experienced authors. 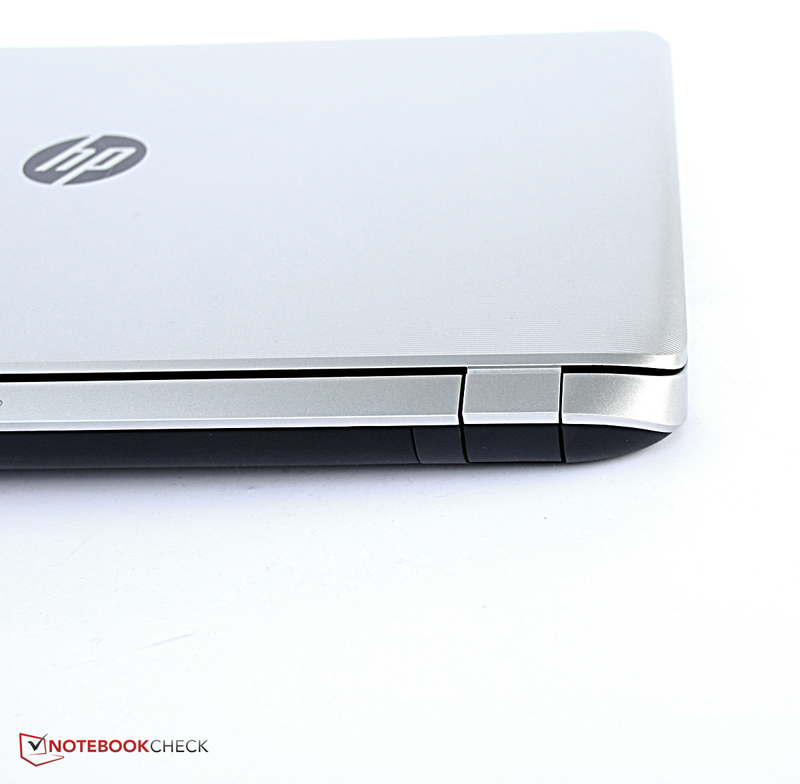 All similarly sized HP Pavilion notebooks use the same case. The most expensive configuration in the HP shop is currently available for 800 Euros (~$1054), so the chassis has to be suitable for much more expensive devices as well. Good for the entry-level HP Pavilion 17-f050ng, which can benefit from the sophisticated, light and pretty sturdy case, very decent speakers and good input devices. This means there are many advantages over the rivals, but there is also criticism: The glossy display has a reasonable resolution; however, contrast and black are poor, and the brightness is very low on battery power. The battery runtimes are okay, but not outstanding, and the performance of the AMD processor still cannot keep up with the rivals from Intel. The dozens of preloaded applications could be an issue as well. Still: If you compare the Pavilion 17-f050ng with the immediate rivals and if you know that you don't get a gaming machine for 400 Euros (~$526), you will see that the notebook is a very fair offer. Many aspects just stand out in this price range, for example, the sound quality. We are also convinced by the low temperature development, the low system noise, the comparatively low weight as well as the nice design. 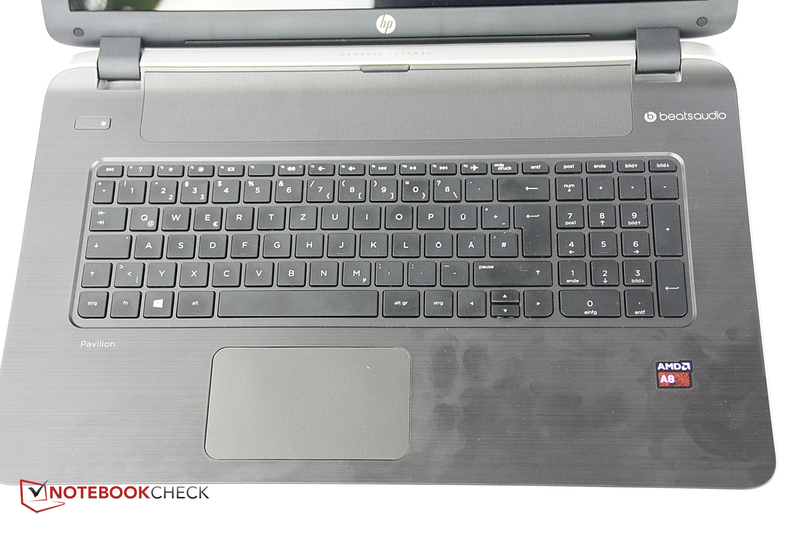 In review: HP Pavilion 17-f050ng. 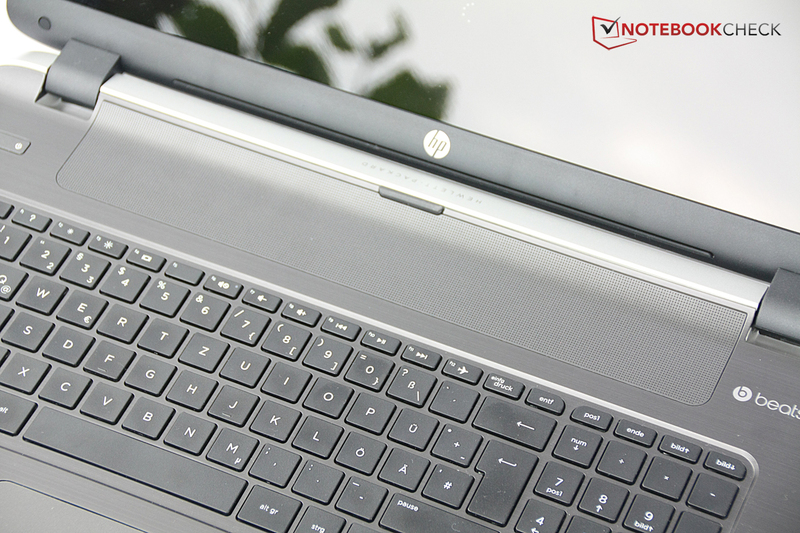 In review: HP Pavilion 17-f050ng. Review unit courtesy of Cyberport. 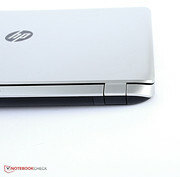 HP offers an inexpensive notebook with the Pavilion 17-f050ng. The chassis could also be used for much more expensive devices. You only get plastic, but the surfaces leave a pretty sophisticated impression. We also like the shape. The bold sweep at the back is a real eye-catcher. 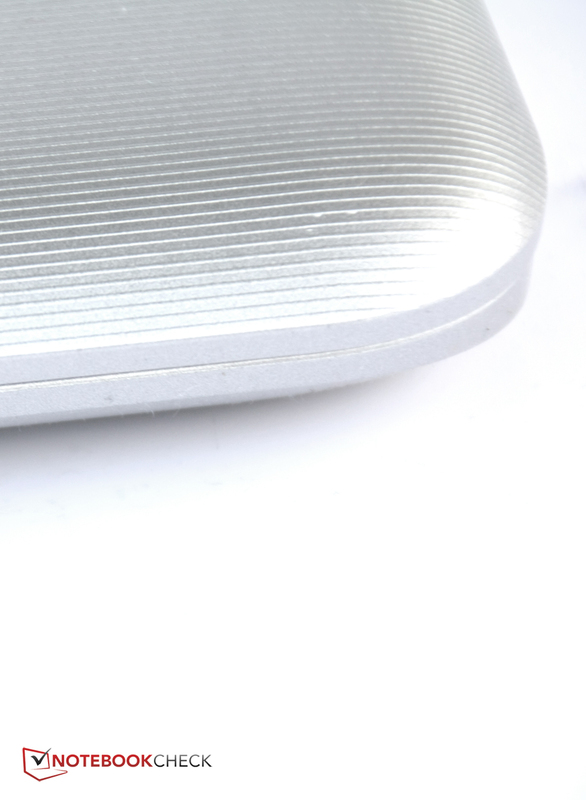 The top of the base unit looks like brushed aluminum. It is nice, but it also attracts fingerprints. The hinges are well-adjusted, but the display still bounces a bit. Less impressive is the screen, which is glossy and has a strong blue cast. The speakers are behind a large grille between the hinges. 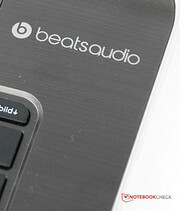 They are supported by software that was developed by Beats Audio. The sound quality is actually good for this price range. The webcam, however, is pretty standard. 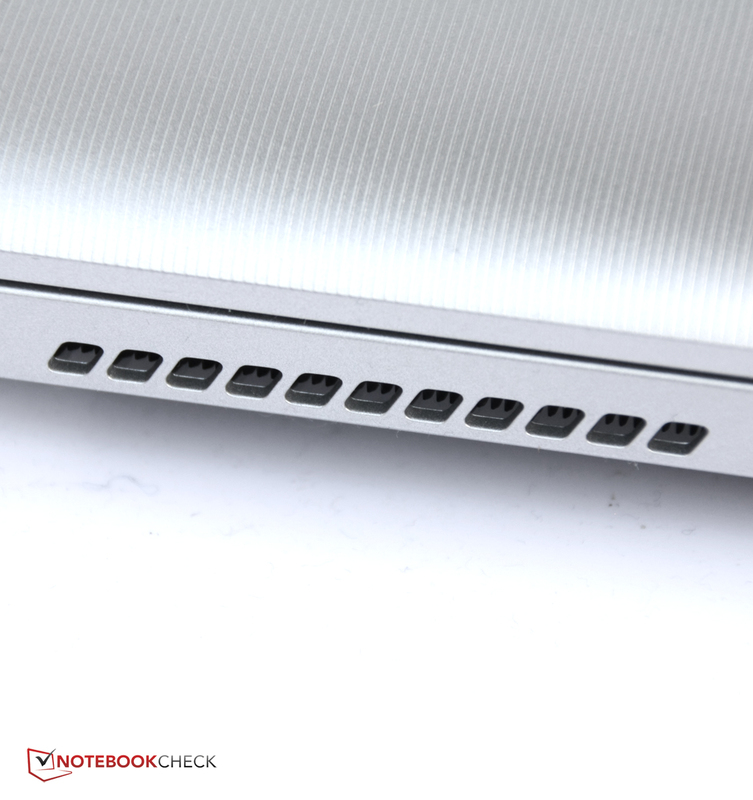 All the ports are at the sides and appear a bit reduced. For example, there is no Gigabit-Ethernet. On the left side is the fan, but you usually cannot hear it. The input devices are decent as well. Keyboard and ClickPad are easy to use and sturdy for this price range. We like the very large keys of the keyboard, only the hard stroke is a bit annoying. The touchpad can be a bit imprecise from time to time, but it is still pretty convenient in general. By the way, the notebook is also comparatively light. 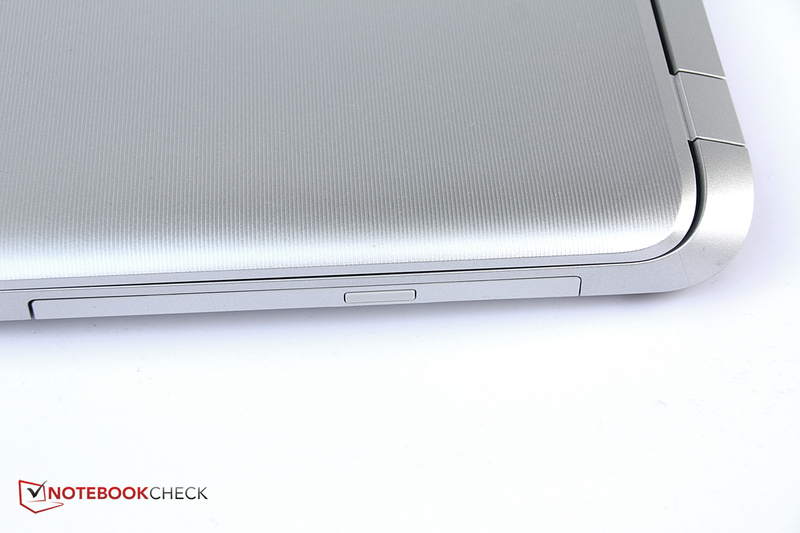 Overall, HP did a good job because they use a mainstream chassis for an entry-level device. 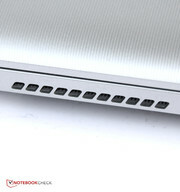 The design of the inexpensive notebook is therefore not bad. The case is almost impressive for this price range. There are a couple of things: For example the above-average build quality for this price range, the decent keyboard and the good speakers – this is not a matter of course for such an inexpensive notebook. The display could obviously be better and anti-reflective. That hardly any other manufacturer had the idea to use an existing case from their more expensive models for an entry-level device. 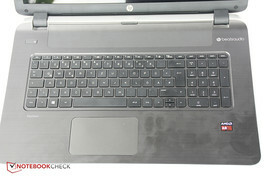 Packard Bell EasyNote LE69KB (with AMD E2-3800 or AMD A4-5000), Lenovo G700, Acer Aspire E1-771, Toshiba Satellite C70D-A-10L.